Simple and practical . . . a tool for rescue. This is more than a cute onesie—it’s a way to help restore malnourished children back to health. When you purchase our “Eat. Sleep. Rescue.” onesie, a portion of the proceeds go directly to help fund Rescue Homes in Uganda..
Plus it’s an exciting way to spread the word about Operation Baby Rescue to your family and friends. 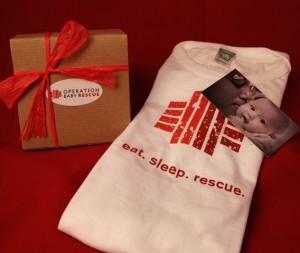 Make your advocacy for malnourished children a family effort by purchasing your onesie today!